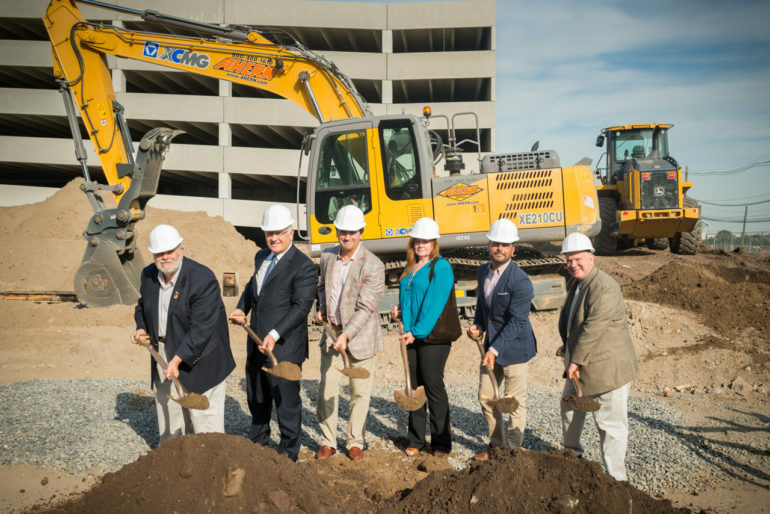 The joint venture, Advance Realty and DeBartolo Development, have announced the start of construction at a new 286-unit community near the town’s PATH station. The project will be among the latest to come to the redevelopment zone within the Hudson County municipality, serving to redevelop what had been a well-known industrial area. The firms simultaneously unveiled another community at 1200 Frank E. Rodgers Blvd., also with 286 units, known as Steel Works. Inspired by Harrison’s industrial past, the property includes a mix of studios, one-bedroom and two-bedroom apartments, benefiting from a location that offers an 18-minute train ride into Manhattan. The partnership celebrated both projects this week at a ceremony joined by local officials in Harrison. Advance is overseeing projects in a 35-acre swath in the development zone, which it has dubbed the Riverbend District. The property is adjacent to Red Bull Arena and at the core of an area that is slated to include restaurants, bars, shops, entertainment and culture. Once complete, the Riverbend District will feature some 3,000 luxury apartments, alongside 100,000 square feet of retail space. Amenities at Steel Works include a fitness center with an on-site spin room and 24/7 on-demand fitness classes, golf and multisport simulator, heated outdoor pool and clubhouse, among others. Apartments feature high-end finishes and additions such as built-in wine chillers, sound systems and an Amazon Echo Dot equipped with “Alexa” voice service. “The success of Steel Works serves as a testament to the demand for lifestyle-oriented housing in urban environments, and we look forward to drawing more renters to Harrison as our vision the rest of Riverbend continues to come to fruition,” said Edward M. Kobel, president and chief operating officer of DeBartolo Development.